More biking makes communities better. And the single most important way to help people bike more is to build places better — better streets, better paths, better parks. Much of the United States is already building for better biking. But it needs to keep doing so, and to do so faster. A smart, transparent city rating system that identifies the communities making the most local progress. The Big Jump Project, which will connect 10 dynamic U.S. cities with the world’s best ideas to quickly build biking networks and measure what happens next. A PlacesForBikes conference for hundreds of local leaders and bike industry representatives from across the country to connect and share tools and strategies for advancing shared goals. The inaugural conference is this June, and registration opened yesterday. The 10 Big Jump Project focus communities will be announced next Tuesday. The city rating system will launch this summer, and part of it will be based on your feedback about your own city. Sign up here if you’d like to participate. The package is made possible with major support from the program’s founding sponsor, Trek Bikes. Meanwhile, we’ll be continuing to live-blog the country’s biking infrastructure revolution here on PeopleForBikes.org, documenting the best work that emerges from communities around the country and elsewhere in the world. 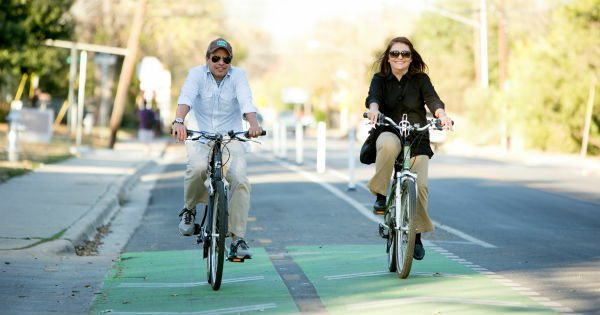 The weekly email newsletter and the Facebook and Twitter feeds that we built during the five-year Green Lane Project are now part of PlacesForBikes, and they’ll continue to cover trends and ideas about all-ages bike infrastructure for the same audience of city leaders, bikeway design and planning professionals and savvy advocates. Because all-ages biking networks are the next great frontier for U.S. biking, that’ll be the primary focus of our coverage: how to connect protected bike lanes, bike boulevards and off-street paths into complete systems that make biking a practical and attractive option for most short trips. If you have stories to share from your community, or ideas for how we might help, please get in touch: I’m [email protected] We’d love to hear your story. After all, great places for bikes are great. But they don’t exist without lots of work from people. PlacesForBikes helps U.S. communities build better biking, faster. You can follow us on Twitter or Facebook or sign up for our weekly news digest about building all-ages biking networks.